The Imo State governor, Rochas Anayo Okorocha has told Imo people that voting any governorship candidate outside Ugwumba Uche Nwosu will amount to committing crime against humanity. Okorocha who stated this in while addressing Journalists at Government House, Owerri on Tuesday, said that neither of them have any tangible plans to move the state forward if giving the mandate. 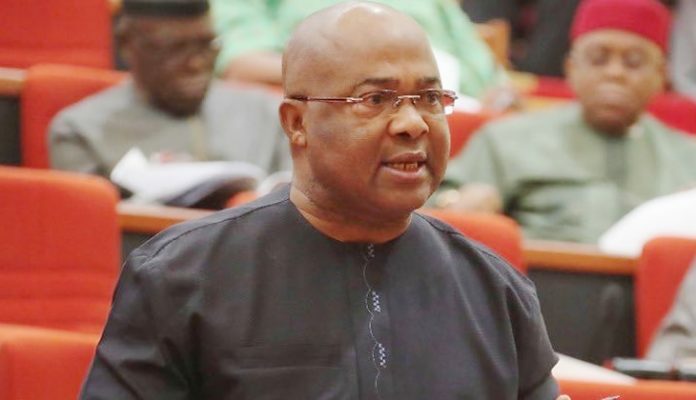 According to him, the emergence of Sen. Hope Uzodinma as the governorship flagbearer of the All Progressives Congress (APC) is a height of imposition on the party members. He also accused Uzodinma and others of being employed by some political big wigs in the country to fight him politically in the state, adding that those who gave Uzodinma APC ticket do not mean well for Imo people. “The APC in Imo State rejected in its entirety the imposition of Hope Uzodinma and some other people who came from PDP. So what we have now is PDP faction in APC led by Hope Uzodinma and what they call Coalition. “But the actual owners of APC have resolved in their thousands not to support the candidate of APC, Hope Uzodinma because he was imposed on them. He didn’t win the primaries; he wasn’t part of the party and he doesn’t have party card. “Those who wanted to impose him right from Abuja did so without the consent of the people and that is what caused the exodus of APC members to AA. So we must stop this imposition. “If Hope wins governor, Imo will be ruled from Lagos and Port-Harcourt. Let me tell you, the battle is not about Uche Nwosu being governor, the battle is bring Rochas down because of what is going to happen politically in future. And my brothers and sister are being used to betray me. “It will be a crime against humanity if Hope or any of these people get more than a thousand votes knowing who they are. These guys have no plan to move this state forward. We should not go back to Egypt.” Okorocha appealed. The Imo state governor also used the opportunity to reiterate that he would stop at nothing in ensuring that nobody rigs in the forthcoming general elections in the state. “There are so much rumors making rounds that the four other candidates that we know and know their track records, that what they are hoping for is to write the results. I mean the candidates of APGA, APC, PDP and Accord. “These are original PDP people, all of them who do nothing but write result sheet. When they came, they displayed it by the way they got their tickets. All those four tickets, they are fraudulent. But we are going to resist that. Nobody is going to rig election here. I can assure you that.” Okorocha said.